Hi .I had a form in my account. When my client opened the link it had been deactivated or unavailable...I cant remember the exact wording. Is there any way for me to get that form back. Hey Emma, here's the link to your form https://jotform.com/61168973317867 and the message says This form is currently unavailable! This was because you Archived that form. To remove it from archive, just click MY FORMS at the top > ARCHIVE > click your form > then UNARCHIVE. 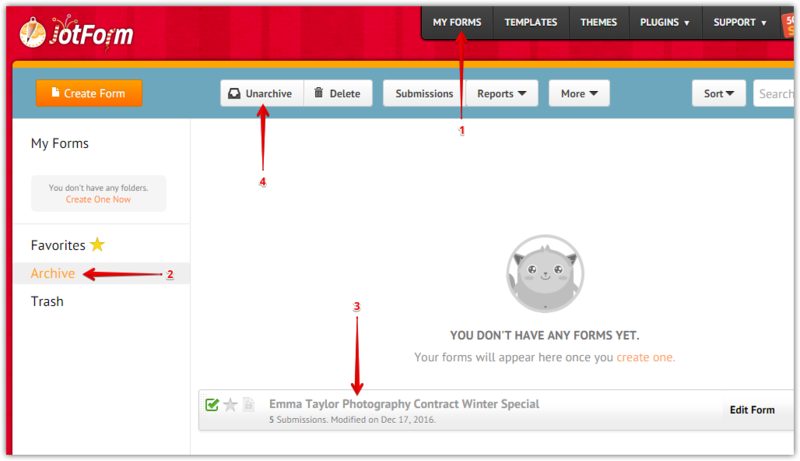 Afterwards, that form will be available and you can access it by clicking My Forms on the left nav.